Skype Co-founders Ahti Heinla and Janus Friss releases an Autonomous robots. 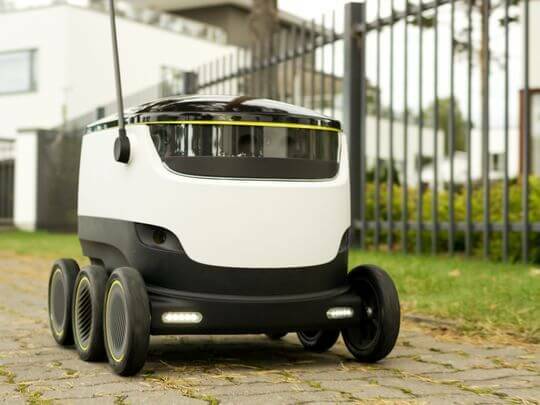 what this robot does is to deliver goods to its respective buyers across the street. This is what Amazon, Google and Walmart has been looking forward to, An experiment for them to deliver goods via drones to their various customer, some kind of flying vehicles to deliver goods as soon as possible. The london base "starship" as the robot called can uses a secure box on wheel to deliver goods within 30 min. It has 6 wheel with an integrated array sensors, the robot can make autonomous delivery within 3 mile radius. It travels about four miles per hour and can carry 20 pounds of goods. The box can hold about two grocery bags worth of goods, and can deliver goods from retail outlets or dedicated Starship hubs. This vehicle called starship look like an high tech cooler you'd love to bring to an occasion or beach. Starship has an inbuilt app that it user can use to track and unlock when the packages arrive their door step. its so secure that only and i repeat only its users has access to it. The company says that the 'bots are overseen by human operators to "ensure safety at all times." Those human operators can also utilize the Starship's speaker and microphone to act as a deterrent in the event someone wants to tamper or steal the vehicle. That operator can also notify police in the event something goes wrong. Starship is actually in it prototypes and testing mode in Us, UK and Britain and expected to be available for most part of the country when launched in 2016.